James L. Hall, 74 of Marysville, died Tuesday, March 19, 2019 at home surrounded by his loving family. He was born October 22, 1944 in Marion to the late Arthur James and Eva (Jolliff) Hall. He was also preceded in death by a son, Michael C. Hall. On October 18, 1964 he married the former Lynn C. Russell in the Millcreek Church of Christ, and she survives. He worked for Westreco - Nestle in Marysville for 29 years, retiring in 2008. He also served on the Nestle fire brigade. He had worked for Thomas Chevrolet, O. M. Scotts & Sons, and Whirlpool. Between the years of 1969 and 1974 he co-owned and operated Hall Implement in Marysville, which sold and serviced Allis Chalmers farm equipment. He was a member of the Millcreek Church of Christ where he served as an Elder, Board Member and sang in the choir. Jim was a volunteer firefighter for Leesburg Township for over 50 years, where he served as chief for 17 years. He was a charter member of the Northwestern Lions Club. 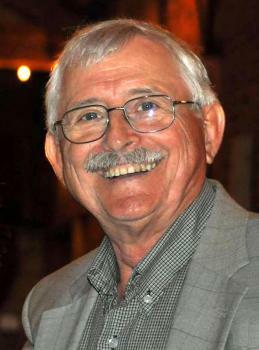 He served on the North Union School Board for 8 years and had served as the president. He enjoyed coaching Little League Baseball with North Union Baseball for Boys. He was a past president and staunch supporter of the Northwestern High School Alumni and was a Young Farmer Alumnus. While in FFA he was taught by Odell Miller and received his State Farmer Degree in 1963. Among Jim’s favorite times were vacationing and fishing with his family in Northern Ontario and in Montana for over 25 years. Besides his wife, he is survived by children, Mark R. (Tina) Hall, Marysville; Matthew W. (Jennifer) Hall, Richwood; Jessica L. (Ryan) Plotner, Raymond; Joshua J. (Leslie) Hall, Worthington; grandchildren, Alexandria (Brandon) Roahrig, Wyatt Hall, Payton Wallace, Cory Wallace, Owen Hall, Miles Hall, Lily Hall, Michael Plotner, Grayson Plotner, Mack Plotner, Arthur Plotner, Evalynn Hall, Sara Hall, Elise Hall, Christopher Hall, Barrett Hall; a great-grandchild, Carter Wallace; a brother, Charles (Peggy) Hall, Marysville; a sister, Peggy (Henry) Edwards, Marysville; brothers and sisters-in-law, William (Cheryl) Russell, Townsend MT; Susan (Michael) Coder, Zanesfield; Roger Darling, Pickerington. Funeral services will be Monday, March 25, 2019 at 11:00 AM at the Millcreek Church of Christ with Pastor Jack Knox officiating. Burial will follow in Millcreek Cemetery. Friends may call on Sunday from 3 to 7 PM at the Millcreek Church of Christ. Memorial gifts may be made to Leesburg Twp. Firefighters Assn., c/o Mark Hall, 14889 Gandy Eddy Road, Marysville, OH 43040 and the Northwestern Lions Club, c/o Jack Knox, 24220 Lunda Road, Raymond, OH 43067 and Northwestern Alumni Association, c/o Judy Denune, P. O. Box 72, Mechanicsburg, OH 43044 . We are sorry to hear about Jim. He was a great person. He was always smiling. We're praying for your family. Prayers for the Hall families. Jim was a kind, funny man and will be missed by many. God's healing for your loss! Mr. Hall was a kind and wise gentleman, always willing to lend a helping hand. I remember him guiding me through the intricacies of Nestle R&D with a smile and a cup of his beloved coffee. My condolences to his family and friends and may he rest in the grace of God. Lynn and family, so sorry to hear about the loss of Jim. Lot of old memories. My thoughts are with you. So sorry to hear about your loss. Prayers to your family. We are sorry to hear about your Dad. The community and friends were blessed to have known Jim. Had wanted to come for the funeral. Can get up there, but flights are full coming back. Dale has a skin cancer surgery on Tuesday morning. Can't chance not being here. So many memories of Jim through the years. I have a record of him singing "Seven Lonely Days" when he was about seven. That's been going around in my mind today. I will miss his wit, smile and all around good cheer. So thankful you have a wonderful family to surround you with comfort and love, Lynn. Hall Family I am so very sorry to hear of your fathers passing. I am so sorry to hear of the loss of Jim. I have fond memories of his always smiling face. He was so very supportive of his teaching staff when I was teaching and he was on the board. I know you all have some great memories as he must have been a great dad. Cherish those memories. I send my sympathy to the entire family. To the Hall family~ So sorry to read about Jim's passing. He touched our lives as a North Union school board member, where he graciously served for many years. I always appreciated him asking about my classes and coaching endeavors with sincerity each time that I spoke with him. He was a very gracious man who shared his time and talents with many. I hope that God wraps his loving arms around you and walks with you through this time of sorrow. To Lynn and the Hall family. So sorry to read of the loss of Jim. He always had a smile. Have many fond memories of building a tractor for tractor pulling, the Marysville Young Farmers and the antique machinery exhibit. I for one will miss him. Again so sorry for the loss. To the Hall family. I am so very sorry for your loss. Jim was a very dear friend of mine. Not only as a co-worker for so many years but as the host of the woods where many of us Westreco workers would gather to hunt deer. So many memories I will cherish forever. Jim could put a smile on so many faces. I will miss him. To each and everyone who loved Jim so very much - May God wrap His loving arms around each one of you and give you comfort, peace, love, hope, sunshine, calmness, and understanding. Jim was a wonderful friend and blessed so many lives! May God be with each and everyone one of you! Praying for the whole family! Love you all and God Bless! This leave us with a great empty space in our hearts. Jim was an amazing person, that touch many lifes with his friendly and kind personality. He will sure be miss. Jim was a steadfast advocate for children. He was a wonderful Board member at North Union and a cherished friend. He leaves a legacy in our schools and in his great family and friends. I was so sorry to hear of your loss. May God bring you peace and comfort during this time. We send our deepest sympathy to Jim’s family. He was truly a wonderful man and we feel blessed to have known him. May God bless you all during this difficult time. Lynn, So sorry to hear of Jim passing. My thoughts and prayers are with you and your family during this hard time. I think of you guys when I drive past your house twice a week to help my sister Jeanne. with his cup. You will be missed. peace old friend and brother fire fighter. Jim had such a personality that would light up the room. He always took the time to talk and give a hug. One of those people that you looked forward to seeing. Jim is going to be missed by not only us but by a lot of people. We extend our deepest sympathy to his family and his friends. He was such a good man dedicated to God, his family, and the community. We were honored to know him and send our deepest condolences to his loved ones. Kevin and I send our condolences for your loss of such a wonderful guy. I have many, many memories of fun times with you and Jim. When I think of Jim, I think of a fine, wonderful man. Jim was always one of my favorites at church and in everyday encounters. Always brought a smile to your face. Jim didn't know a stranger! Lynn my heart goes out to you and the family. I just saw Jim in October at my dad's funeral. He will be missed. Sending prayers to you all! So sorry to hear of Jims passing. Jim knew now strangers and always brought a smile to your face. I just saw Jim in October at my dad's funeral. He will be dearly missed. Sending you all my love and prayers. We were shocked and very sorry to read of Jim’s death. We certainly valued the friendship we made so many years ago. May God be with you in the months to come. So sorry to hear of Jim’s passing. He was truly one of a kind and will be greatly missed. Meeting him was always the same … a big smile, direct eye contact, arm quick to extend, firm handshake, and right into the conversation…it almost seemed like an automatic reflex for him. Definitely going to miss that. I often think of the summer of ’86 and the trip to Parry Sound, Ontario with the Hall family. Whether it was fishing, playing games, making campfire pies, or chasing bears out of the campground, Jim had a gentle nature and quick wit in all matters. It was always evident to see how much he cared for those around him. So glad and thankful to have had the opportunity to spend some time with him and his awesome family. Go rest high on that mountain, Jim, your work on earth is done. I’m sorry to hear of the loss of this great man. He was always so friendly and always had something nice to say to you. I am very sorry to hear of you and your families loss. Deepest sympathy and many prayers sent your way during this time. Sorry for your loss. Our prayers go out to his family. We are so sorry to hear about Jim's passing. We had the pleasure of working with Jim for many years in both his time at Nestle and the Fire Department. He will be missed. Our thoughts and prayers are with his family. check up on me. Always friendly and kind. May God bless your family. Dear Lynn and family, I am sorry to see about Jim’s passing. My heart goes out to all of you. We are so sorry! You have our complete sympathy! He will surely be missed by a world of people. We will miss his good humor and smile. Jim was a very special guy. So sorry for your lost. the community has lost a good guy. Prayers. Remember all of great times of your Dad. Prayers of comfort to all of you. May God grant the Hall family strength and comfort during this time of sorrow. I have many good memories of Jim over the years with the many activities that he was associated with. Jim will always be remembered. I'm deeply sorry for your loss. Jim was a really great guy and I'll miss him. Ever since I can remember since I started hunting with my dad and grandpa when hunting season came we'd stand and talk and swap stories for seemed like forever. These memories I'll always have of him and will definitely miss him.I pray for you all and give my deepest sympathy for the family. I’m so so sorry for your loss  thinking’s of you all! We are saddened to hear of Jim passing. He was such a kind and friendly man with a ready smile and positive demeanor about him. He will truly be missed. Will miss his smiling face at the fish frys and meals in Magnetic. Our deepest sympathy to all the family. May God lift you up in your time of sorrow. #53 Private Log in to view. Whitcomb Riley Hall" as we called him when we were children. He will be missed. My mom would always tell me, Jim and Lynn were like my second parents when I was a baby. She said they were so good to me and loved me like I was there own. I’m sad to hear of Jim’s passing but I know my dad and Jim will be getting the band back together! Though I don’t have the memories, I have thanks to Jim and Lynn for treating me as their own. Heart felt sympathies to Lynn and family. Sincerely Tamara Baldwin- Nail. So very sorry for your loss. Jim was a good guy. He had a way about him that just made you happy be around him. Our prayers are with the family. So glad I knew Jim. Sympathy to all of you. So sorry to hear about Jim. I could always count on his smiling face to make my day better. So sorry to hear of Jim's passing. He was one of a kind, a really special man. Sorry I was unable to make the viewing. Please accept my condolences. Our heartfelt condolences and prayers are being sent to the Hall family at this difficult time!! We will miss Jim and that beautiful smile always. We wanted to be there for you all and to say goodbye to Jim, however, we are both down sick with this virus going around. We will be with you in spirit for sure. Jim and Lynn made me feel so welcome when I joined the Hall family many years ago and I will never forget their many kindnesses. Jim had a way of seeking people out and making then feel like they were the most important person in the room. He always checked in with everyone at family gatherings and was sincerely interested in how we were doing. This made a big impression on Hillary and she enjoyed visiting with him, even in her shy, younger years. While we can rejoice in the knowledge that Jim is catching up with his mom and dad, Uncles Ted and Meredith, son Mike and so many others in heaven, there is going to be a big hole here for the rest of us who so enjoyed being in his presence. We will never forget what a peach of a guy he was but we will miss his smile and his unconditional love. My deepest sympathies to you. I enjoyed working many years with Jim, and he helped me on numerous occasions, always with a smile or small joke that made my day a little brighter. That goes beyond measure. Love and prayers are with the whole family. He was a caring, giving, loving man and will be missed. Cherish the wonderful memories. My condolences to the entire Hall family in your loss. I will always remember Jim and smile at the very thought of conversations with him. He was always a pleasure to work with involving the Fire Department. He made a significant mark on the community and he will be missed. A community is eternally grateful for his many contributions and for the family sharing him with us. I am sorry for your loss, high respect for Jim - had such an impact on so many of us growing up. May God bless your time of remembrance of him.